Busselton Primary School uses Positive Behaviour Support to improve behaviour and explicitly teach social skills and values while fostering a positive attitude towards learning to achieve higher educational outcomes. It is our intention that this will develop a positive school culture with parents, staff and students which is consistent and based on a common language. We encourage students to be active participants in a safe and supportive environment. 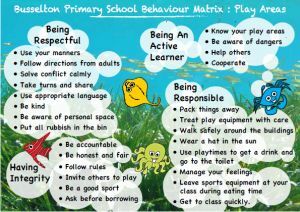 At Busselton Primary School we focus on four behavioural expectations and explicitly teach students the expected behaviour through a variety of strategies including role play and constant teacher feedback around expected behaviour. Behaviour education is support by the Bounce Back and Challenges and Choices programs. 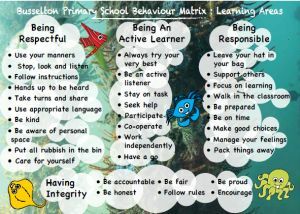 Our ‘behaviour matrix’ is used to remind students, staff, parents and visitors of the positive behaviour that is expected at Busselton Primary School. These expectations are clearly labelled throughout the school both in the playgrounds and the learning areas. Staff at Busselton Primary School focus on engaging students’ learning. They are continually up-skilling and use a variety of engagement and behaviour management strategies to promote productive behaviours thus allowing students to focus on learning. Busselton Primary School uses an encouragement system to acknowledge, promote and reinforce positive behaviour. 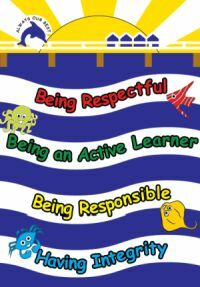 Students frequently receive ‘RARI’ tokens as acknowledgement for displaying behaviours related to the four expectations. These are used to achieve class rewards and individual rewards at school assemblies. Students receive ‘Gold Card’ stamps when regularly displaying positive behaviour in class. When a student collects a designated amount of stamps they receive a prize from the deputy principals or principal. At Busselton Primary School we constructively and specifically address unproductive behaviour. At Busselton Primary School we collect behavioural data on both minor and major behaviour incidences. This data is used by the Positive Behaviour Support committee to focus on areas of need and implement school wide systems to support staff and students.